Lyocell Fiber Market size was over USD 850 million in 2016 and is anticipated to witness growth at a CAGR of around 8% over the forecast timespan owing to its extensive usage in various end-use industries including home textiles, apparels, and medical equipment. The population has been continuously rising over the past few years. The rising per capita income of the people in Asia Pacific has fueled the textile and apparels industry growth. Robust economic growth has noticeably escalated the textiles demand. The increasing demand along with ongoing innovations in the textile manufacturing will drive the global lyocell fiber market in coming years. The product possesses high strength, especially in wet state. It has high durability and doesn’t shrink, which makes it a preferred choice for home textiles and apparels. It can easily blend with other fibers and can be dyed to provide desirable decorative effects. The product fibrillates under certain conditions which imparts aesthetics to the fabric. The rapid development in the healthcare industry has also boosted the lyocell fiber market. 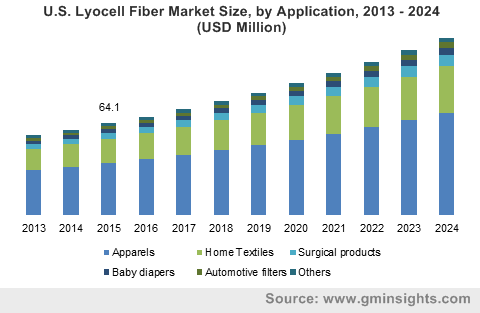 The growing awareness of using sterilized products coupled with the increasing popularity of biodegradable fibers is likely to drive the lyocell fiber market. The antibacterial properties of the product make it suitable to be used for surgical products. The product manufacturing involves a closed loop process, wherein solvents and chemicals employed can be used again. The eco-friendly manufacturing process is also a major factor that will propel the lyocell fiber market growth. The chemicals used in the manufacturing process do not pose a threat to the environment as they are used in small quantities. These factors will have a positive influence on the lyocell fiber market. The factor which can obstruct the lyocell fiber market is the fact that the fiber is expensive than its counterparts such as rayon, linen, ramie, and cotton. This makes the apparel manufacturers to use the substitutes and thus restrains the industry growth. Developing technology to reduce the production cost may lower the factor impact in coming years. The cross-linked fiber is not easily biodegradable, owing to its low fibrillation property. Landfill, composting and incineration can be used to decompose the fiber. Cross-linked fibers can be used in many filter applications and gives a silkier texture than the staple fiber. The major applications of cross-linked fiber are in jersey fabric, woven fabric, and knitwear. 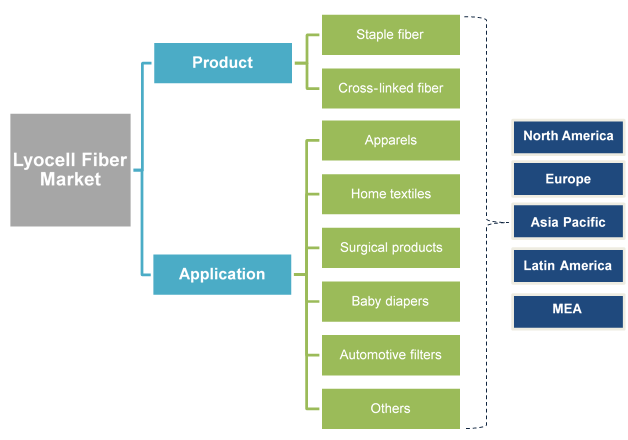 The lyocell fiber market is segmented on the basis of applications into apparels, home textiles, surgical products, baby diapers, automotive filters and others such as vehicle carpeting, cigarette filters, etc. The apparels segment has dominated the lyocell fiber market and will continue to do so over the forecast period, owing to the desirable properties such as softness and absorbent qualities. This segment includes casual wear, denims, knitwear, sportswear, coats, and a variety of products. In 2016, the apparels segment accounted for more than half of the global lyocell fiber market. This segment has significantly contributed to the economies of the countries with the aid of online retail. Apparels segment is followed by home textiles, which include bed sheets, drapes, curtains, and carpets. This segment had more than 20% share of the overall lyocell fiber market in 2016. The product is used in several medical accessories such as absorbent pad, wound-contact layer, elastic and non-elastic bandages, compression bandages, gauze dressing and wipes used in the operation theatre. The product is used in non-woven apparels such as baby diapers, surgical swabs, and filtration applications, as it has better moisture absorbency than its substitutes. It also finds application in dehumidification sheets and a precursor for carbon fiber. In automotive sector, the product is used for seat covers, battery separators, etc. The regional analysis has been carried out for North America, Europe, Latin America, Asia Pacific, and Middle East & Africa. Asia Pacific has contributed the highest in terms of volume and revenue and is estimated to grow with the rising trend. Lyocell fiber market demand has been triggered by growing textiles industry and improved living standards. The region held a market value of over USD 550 million in 2016 and will grow at a robust pace. With increasing apparel exports, the manufacturers in the U.S. have designed new strategies to compete in the industry. Mexico represents a significant market for textiles. Several apparel brands have expanded their business in Mexico which will augment the product demand. The lyocell fiber market demand is anticipated to increase in Europe, owing to the presence of numerous textile industries in France, Germany, and UK. Lenzing AG, Acegreen Eco-Material Technology Co., Ltd., Aditya Birla Group, Baoding Swan Fiber Co. Ltd., Nien Foun Fiber, Chonbang Co., Ltd., Weiqiao Textile Company Limited, Zhejiang Yaojiang Industrial Group, China Populus Textile Ltd., Great Duksan, Qingdao Textiles Group Fiber Technology Co., Ltd., Smartfiber AG, and Acelon Chemicals & Fiber Corporation are some of the major companies in the lyocell fiber market. A low degree of backward integration characterizes the industry ecosystem as apparel manufacturers often tend to manufacture their own fibers. Also, the fiber producers such as Lenzing AG manufacture raw materials for product manufacturing.